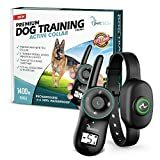 1 What is Dog Training Shock Collar? 3 Why Do You Need Shock Collar Training for Dogs? What is Dog Training Shock Collar? If you have a puppy with several behavioral issues, particularly aggressiveness, and getting a solution to deal with this problem is difficult. Then you should think of solving this problem by giving a dog training shock collar a chance. Appropriate training is crucial when raising your puppy; though it can be very tough to contain the attention of the pup even for limited amounts of time. It can be difficult getting the attention of a young, noisy puppy that is running after a squirrel or towards another dog. The shock collar is an electronic dog collar that will give a shocking sensation to the pooches when they do something wrong. These days, shock collars are usually used to reduce the different type of stubborn and annoying behaviors in family dogs, from food aggression to excessive barking, as well as to train puppies to stay safe inside the property line or to stay around when off-leash. Shock collars are not used as a punishment, but as a deterrent to unsafe or unwanted behavior. The idea is that your dog will associate the unsafe behavior with a little uncomfortable shock and stop the action or behavior until they no longer need a reminder. The shock administered by a proper shock collar is harmless; therefore while it is enough to attract your dog’s attention and discourage certain behaviors, it will not cause any permanent physical damage. With many shock collars, there are numerous levels of enforcement, so you can adjust the level to rebuke the unsafe behavior accordingly. For instance, a lot of shock collar will produce a vibration signal as a warning before the real shock is delivered to the dog. Also, the beeps allow you to give a spoken command either “No!” Or “Down!” With a warning vibration or a beep to further interrupt the unsafe behavior. This collar doesn’t only shock the dog; it usually comes with some kinds of enforcement such as shock, sound, and vibration. Each of this enforcement can be used on its own or in combination with another and will have different levels of intensity that anyone can adjust the device to use on his or her dog. All adjustments can be initiated automatically when the dog barks and moves sharply in a pushing fashion or through a remote control device held by the trainer or the dog owner. The goal is to set the collar on a level that when it’s introduced, the dog will show signs of being distracted from what they express their hostility towards. Once you find the level that does this to your dog, then you can set the device to that level. The following are the useful situations you can make use of shock collars. Why Do You Need Shock Collar Training for Dogs? A lot of dogs particularly rescue dogs can come with many personal problems that need to be addressed. In a lot of circumstances, little is known about the dog’s former living conditions or the previous owner. Some of them come from abusive homes; end up as a stray dog, fighting for survival on the streets, which can create problems of aggression towards other dogs. You can train your dog with a shock collar not to bark at other dogs it’s come into contact with during walk or in a social environment. By making your pooch understand that it is not right to bark at other pooches with a slight shock, it can stop the escalation and the probability of a dogfight that can threaten your dog, and even you. Appropriate training is essential when nurturing your puppy; however, it can be very difficult to contain the attention of your dog even for limited amounts of time. When walking your dog, if you discover that you are being tugged around by a curious and excited dog which is not the right way for this activity. By using shock collar at a low level, you can let your pup know that this behavior is unacceptable. With a shock collar, you can make your pooch realize that you are walking him or her and not the other way round. A lot of people relate these collars with something negative, but the fact is these shock collars can provide numerous benefits that easily surpass the negative aspects. These collars can be very useful and the following are just some of the basic advantages that they could provide. Some dogs don’t just want to stop barking and bark almost at everything. In addition, they bark during the night, which can be very annoying, and even disturbance to your neighbors in their own home. With these shock collars, you can help reduce or completely eradicate the sound of bark from your house and around you. This means that you and your neighbors can finally have some peace. For instance, if you want to control chronic barking behavior, this collar even works while you are away from home. This can be useful if your neighbor’s complaint about your pooch’s noisy barking. And the same applies when using these collars to control your pooch movement, although it requires some hands-on training. Personally, I don’t usually leave my puppy alone with a shock collar, I prefer being around to see the situation myself, so I can adjust the collar if need be. But this is your choice. In addition, we do not endorse leaving your pup unattended outside your house for long periods of time, with or without a shock collar. Shock collars can help you save a lot of cash since you will not have to use any professional behavior to train your puppy. You can use these collars to train your pooch by yourself when you get this collar, why spend expensive cash on these behaviorists? Some dogs like to get away and run around the neighborhood, or even around the city where they live. This can be dangerous both for your dog and for everything and everyone around him. You don’t want to have him hurt another pet or a child, or have him hits by a car. A shock collar can be used to train your pooch not to leave your home, which will help your dog and others around him to be safe. Pooches are wonderful companion only when they behave well. Unluckily, this is not always the case and having a badly behaved pup can be a bad experience. Training a dog has at no time been so easy, and with the help of a shock collar, even a bad pooch can now learn to behave well. 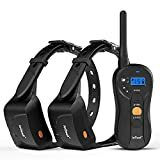 Now check out the following dog training collars and you can purchase any of these from Amazon online by following the link. Petrainer is the ideal training system for beginner dogs with two waterproof receivers. If you want to have a good time with your dog, you must correct dog obedience around the house or during the occasional walk in the park, and then you should not investigate further. This system is designed and built with a new user in mind and adapts to the needs of any trainer, with 3 modes: Sound alert, Vibration, and Shock. 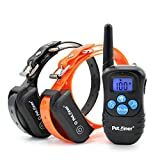 Waterproof remote dog electronic collar receivers. Easily accommodate, and designed for beginner training to expert dog training. This training shock collar fit to small, medium, large sized dogs without any issue. Double protection mode enabled to secure your dog. This comes with the training of whistles, vibrations and static discharges for you to choose. Choose the most efficient training mode for your dog and teach him basic obedience commands. We recommend that you first try the signal or vibration mode. If your dog does not respond to whistling or vibration, you can attempt the static mode of the low level of static stimulation. Training Collar included 3 safe training modes such as a beep, vibration and shock models to control dog behavior. Security keypad lock help to avoid accidental shocks to the dogs. With 1 remote transmitter, you can train up to 9 dogs, and best suitable if you have more than 1 dog at home. Adjustable shock collar perfectly suitable for 15lbs-100lbs dogs (small, medium, and large dogs). The PetTech remote training collar is equipped with training modes: light, beep, vibration and static discharge. Improper use of the static shock mode can cause pain, physical injury, and traumas to your dog. You must use the Fixed Crash feature in extreme cases only after consulting with a professional dog trainer. 100% Waterproof, rechargeable, premium shock collar for ranging 15-100 lbs dogs. Safe Training modes to ensure your dog safety at maximum level. It's a wireless collar and covers up to 1200-1400 feet. Highly customer satisfied product and You can train up to 2 dogs together with this collar. Lifetime warranty dog training shock collar (*terms and conditions apply). PetSpy Dog Training Collar improves the strength of distance training quickly, easily and professionally, helping you to improve your dog’s daily behavior. The PetSpy P620 training collar is designed exclusively to help professional dog trainers as well as pet owners for the first time to train their dogs these days. Quickly rechargeable, waterproof professional dog training E-collar. Equipped with 3 training modes, 16 adjustable levels for accurate dog behavior control. This is a remote collar and it covers up to 650 yards area. 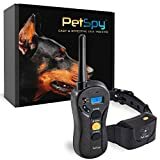 PetSpy training shock collar fit all dog breeds ranging from 10 to 120 LBS. Lifetime replacement warranty (*Terms and Conditions apply) with customer support. The iegeek training collar is one of the best highly recommend a product for all the dog owners, you can easily train your aggressive dogs with user-friendly modes. 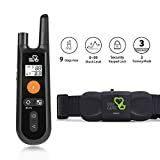 IeGeek provides excellent customer support to resolve all the customer issues, so you can purchase it worry-free, Moreover, this shock collar is best suitable for small, medium, large dogs ranging from 22 to 100 LBS. High quality long lasting battery. You can have total control over on your dog's behavior with 3 collar modes. Waterproof, turned on double protection to secure the dog. Shock collar perfectly fit small, medium, large dogs. More convenient customer support, and easy to use a product. These are the best dog training shock collars available in the market, I hope you will choose the best one to teach your dog professionally. In conclusion, according to dog owners, a shock collar is one of the best investments in a dog that you can get. If you have a dog that you want to train and you want to see the results in a very short time, this is the best option for you. There are many training methods you can use to stop your dog from behaving negatively or to stop barking, a shock training collar has to be the best. However, it is really important that a dog owner knows exactly what they want, and to look for the perfect collar that meets all the requirements of individual dog owners. If you have a puppy with several behavioral issues, particularly aggressiveness, and getting a solution to deal with this problem is difficult. Then you should think of solving this problem by giving a dog training shock collar a chance.